I’ve personally never had any major – volume or other – issues with my Treo 650 but I have on occasion had people tell me that they couldn’t hear me well or that the sound was faint so I installed VolumeCare. I have to admit that when I first started fiddling with VolumeCare I really thought that it didn’t work at all because I just couldn’t immediately tell the difference between the ‘normal’ Treo volume and the new ‘enhanced’ one. However, considering the raves that it had garnered I thought that I should test it properly to find what if any improvements might be in store for me. I was in for a massive surprise. I had never really stopped to think about it but after installing VolumeCare ($14.95) I realized that there are in fact 3 speaker and 2 microphone settings on my Treo – all of which VolumeCare can now control and make individual adjustments for. Handset: This is for the earpiece speaker through which you’ll listen to a caller. Speakerphone: This is the small speaker found at the back of your Treo just below the camera which is activated when you press the Speakerphone button during a call. Headset: This controls any external wired headset (not Bluetooth). MIC Volume: For the main telephone microphone found at the bottom right front of the Treo. This will undoubtedly be the single most important setting that you’ll make as above all you want to make sure that the person at the other end of a call hears you loud and clear. Back Speaker: Again, this refers to the small speaker found at the back of your Treo when it is used by any applications other than the Phone. Think of your Start Volume as your default MIN and the Boost Level as the MAX of the overall range of volume that you want to set for your particular needs. How far down the Start Volume scale and how far up the Boost Level scale you decide to set your MIN and MAX will vary depending on a) your particular Treo model (believe it or not each works slightly differently when it comes to handling sounds), b) the level at which the MAX begins to distort sounds and c) your own voice and hearing levels. The first four settings (handset, speakerphone, headset and MIC) are all related to volume adjustment within your Phone application and therefore easy to test during a call. I suggest that you leave all the Start Levels as they are after first installing VolumeCare and that you initially set all the Boost Level settings to the top end of the scale – after testing you’ll be able to adjust these downwards. Handset, Speakerphone & Headset: Make a test call to a friend and once he/she answers the call determine if the Start Level is adequate as your default setting for ‘normal’ environments. Then adjust the volume to the maximum with the side volume button to determine if the inbound voice can be heard without distortions. MIC: As I mentioned earlier, this will probably be one of your most important settings as it determines how people hear you. I recommend calling your voicemail and recording yourself speaking each of the volume numbers that appear on screen as you move the volume up and down with the Option+5Way druing a phone call. This is really the test that clinched it for me as suddenly at the maximum boost level my voice was coming across much louder and clearer. Meanwhile, the Back Speaker setting can best be tested with an mp3 player (RealPlayer or PocketTunes). Just blast the music on max volume – it gets amazingly loud – and bring it to a level where you don’t suffer any sound distortion. Thereafter lower the Boost Level to the maximum level that you reached where distortion was not noticeable. Across all tests I typically found that VolumeCare increases the default Treo volume by between 10% and 20% with strong and, more importantly, clear sound coming through. Stereo Headphones: if you use a wired stereo headphone like my Retractable Seidio 2–in-1 then you’ll need to tick this box. Stop Alarms During Calls: do you find that alarm reminders in the middle of a call are a nuisance? Then tick this box as well. Use Safe Volume Graph + Fix Call Waiting GSM Bug: these options fix two minor conflicts which may occur between VolumeCare and other applications. You should click on the Help button on the bottom right to read more about it and determine whether you should enable them. You may already have noticed that I didn’t cover two other settings (below) and this is because they only become active if you purchase a separate VolumeCare Add-On ($5.00) which enables these. Ring Tone: If the maximum Level 5 setting in your Sound Prefs is still not loud enough for you then VolumeCare will be able to bring that up a serious notch so that hopefully even if your Treo is in a bag or you’re out in a loud environment you’ll still hear it ringing. Enable Application Control: this option which works exclusively with the Back Speaker was designed to allow only those applications that you choose to benefit from increased back speaker volume boost. For example, some people wanted Pocket Tunes and their TomTom GPS Navigator to be louder while leaving all other application volumes (such as that of their alarm clock) untouched. Simply find the application that you want tied to the back speaker in the list and click ‘Add’ to enable it. VolumeCare and the VolumeCare Add-On are available in the Treonauts Software Store and since this is ‘Galactic’ week I decided to create a special 20% off coupon valid until Monday 19 September. Simply enter the promotion code TREOGALACTIC in your shopping cart. What would be more useful is if the Treo would listen via the microphone and adjust the sound output based on the difference with ambiant environment. I work in a quiet office, but also drive a convertible. I must be missing something, I tried the mic test, but the Option+5Way combo gives me no numeric values. What were you in when you did that? evilgeezer - sorry if I wasn't clear about that. You have to do the Option+5Way during a call. Where can I get technical support. I bought VolumeCare from your site today Sept 19. You promotional offer of 20% off was not applied to my purchase - why? Please refund this to me! his is my first purchase from treonaut and this snafu was not nice. the 20% discount was not applied to my purchase as well. When I called they knew nothing of the sale. I purchased Volume Care & installed with ease. However, I am now getting a message that my "Trial Period is over and I need to register from the same location I downloaded the software. How do I do that???? My mic volume is still hopeless. What else can I do? I have Volume Care and Ad On! I just recently tested VolumeCare Pro on my 700p and it was fine in the beginning. Then suddenly everything worked great EXCEPT when I tried to put a call in speakerphone mode... instead of it being easier to hear, it got harder. Fortunately, as soon as I deleted VC my speakerphone volume went back to normal. Very disappointing as I liked VC otherwise. I am brazilian and would like buy a display for my treo 600 that it is lost do you have to me? Just added Volumecare to treo 650 (Sprint). Works very well. Until I get in bluetooth car, then the phone loses its pairing info, and the bluetooth beeps every 10 seconds wheteher the phone is on or off. Any ideas? I installed Volume Care a couple of weeks ago. It works, and I'm glad I bought it. can i use this on my Palm 750 Windows OS? Any word on the WM version? They also don't tell you that when your Bluetooth is on, Volume Care doesn't work. My Treo died the death, and I had to do a HARD RESET. Upon doing so, Volumecare stopped working, and wanted new registration numbers. Gotreosoftware have refused a paying customer trying to get his system working, AND WANT MORE MONEY FOR A NEW KEY! That is doubtful, as this code worked before. the original serials, keys, and codes. You are the only company which I am having problems with so far. is created from the unique information in your device. Why do I require a replacement? However, when I use these numbers, it won't register. 1) GoTreo has to hire a full time person just to provide replacement license keys to people. 2) Until now, we have simply absorbed the cost of this service. We do not believe in raising the cost of applications to cover a cost that not everyone will use. 3) GoTreo has never charged for upgrades to software. It is not right to charge people for us to fix bugs! 4) We have never charged for new device support. 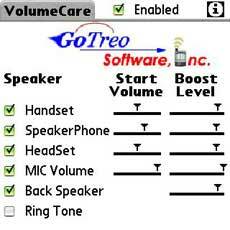 If you purchased VolumeCare, for example, on a Treo 650, you are welcome to load the new version on your Centro without charge! Each new device takes approximately 1 week minimum of developement time to make that same application available on the new device. Well the time has come where GoTreo can not continue to cover the complete costs for all of these services. So I have made the decision to charge a fee for license key replacements. The key given at the time of purchase is absolutely valid for the live of the program. If something happens on your device that causes you to need a new key, that is out of GoTreo's control. This is the area that is causing GoTreo the most time and money. So this is the area that we have decided to charge for this service. GoTreo strives to produce the very highest product quality and customer service possible. Every day we do our very best to continue to earn your business.